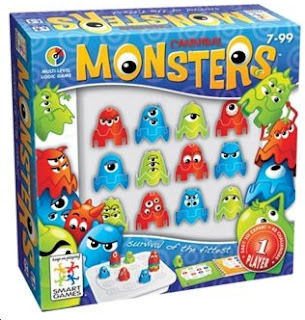 The object is to assemble the red, green and blue monsters onto the grid and then make the monsters eat each other up and end up with 1 big stack. Scrutinize the feet of the red monsters and you will notice that they fit snugly only on the blue monsters. The blue monsters can fit on top of the green monsters. And to complete the cycle, the green monsters can eat the red monsters. It's hard to describe. I would just say that Cannibal Monsters has more of a Lunar Lockour feel than a Sudoku feel. At the end you will end up with 1 big stack. I've enjoyed analyzing the possibilities. On some, it's possible to determine which monster will be at the bottom, which means he's the only one that never moves. Of the 48 challenge cards, I've done the first 28. At the moment, I'm stuck on #29. In recent years there has been a trend of publishing puzzles like this on the itunes store as puzzle apps. I'm hoping that happens. Still, the tactile feel of these mechanical puzzles are fun!